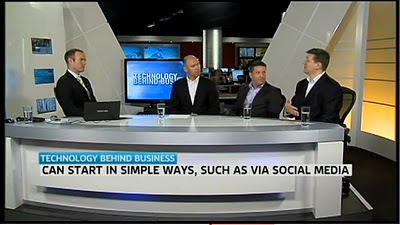 Creative Intersection MD, Ian Exaudi, has taken part in a panel discussion on Sky News Business Channel's "Technology Behind Business" program on the topic of "Online Presence for Small and Medium Businesses". Other Expert panel members included Tim Reed (MYOB) and Tony Palmer (C4). The main point is that the majority of SMB's do not have a website .... but you do not need to be an "online business" to enjoy some of the benefits of having a website, and there are many ways to "dip your toe in the water". Of course, if you would like any assistance with getting your first business website up and running (or improving an existing one), give us a shout on 1300 853 868 or visit our website (http://CreativeIntersection.com).